Celebrating Christmas in Israel, the land where Jesus was born and built his church can be an especially meaningful experience. Since the native Christian population is small, don't expect the Christmas atmosphere you may be used to at home. Non Christians go to work as usual. 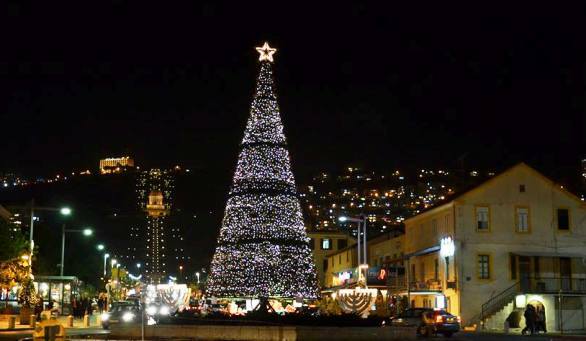 But you can discover the unique spirit of Christmas in the Holy Land in a few Israeli cities with a rich Christian heritage or significant Christian populations. So where are the best places to enjoy the holiday season in Israel? There is nothing like a beautiful Christmas tree to get into the atmosphere of the holiday season. 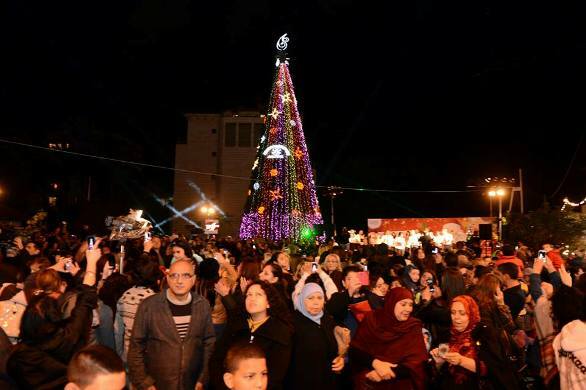 You can find the largest Christmas trees in Jaffa (Tel Aviv), in Haifa and up north in Nazareth. On the week before Christmas, all these places have outdoor festivals, Christmas music, concerts, arts and crafts stalls and family-oriented events. Midnight Mass on Christmas Eve in Bethlehem is certainly the most popular place to celebrate Christmas! The Nativity Church commemorates the place where Mary gave birth to Jesus. It's an amazing, magical event with Christians, Jews and Muslims celebrating together at Bethlehem's main square, Manger Square. You can watch the mass taking place in the church from a huge screen installed in the square. If you want to take part of Midnight Mass within the Nativity Church, you must buy tickets in advance HERE. At 1 AM just after mass, the crowds welcome the Latin Patriarch of Jerusalem arriving in Bethlehem from the Old City of Jerusalem. How to get there? 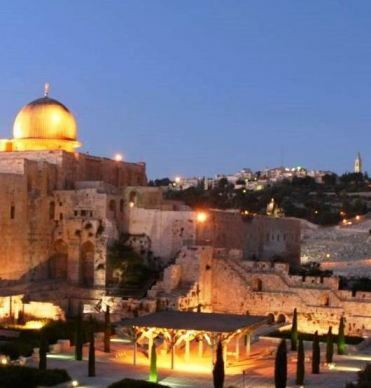 During Christmas Eve, the Ministry of Tourism offers free transportation between Jerusalem and the Church of the Nativity at Bethlehem, about every 30 to 60 minutes. Or join the communal walks that leave from Jerusalem. Read more just below. There are many events and prayers celebrating Christmas in Jerusalem. 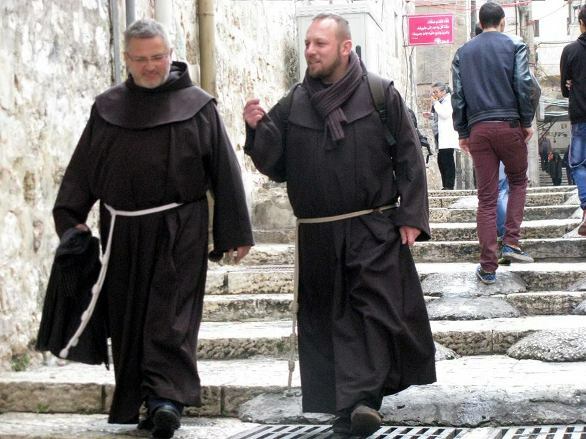 On Christmas Eve, you can join the Christians following in the footsteps of Jesus from his trial to the site of his crucifixion and burial at the Church of the Holy Sepulchre, walking the Via Dolorosa in the Old City of Jerusalem. After midnight Mass at the Holy Sepulchre Church, you may want to take part in the Latin Patriarch's Procession from the Old City of Jerusalem, passing the Mar Elias Monastery and reaching the Church of Nativity in Bethlehem at around 1 AM. At midnight, you might prefer to sing Christmas carols at the Benedectine Church of the Dormiton on Mount Zion in Jerusalem, and then join that procession to Bethlehem at 2:30am. 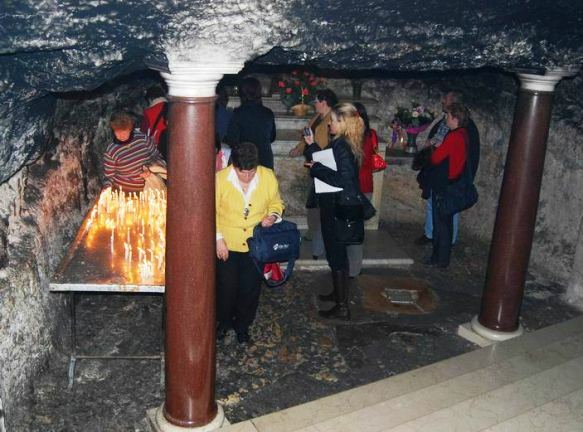 This church is dedicated to the spot where Mary fell into eternal sleep. Christmas Eve mass at the beautiful chapel of the Notre Dame of Jerusalem Center, built by the Vatican in the 19th century. There is also a fascinating 'Shroud' Exhibit at the Center. The annual Christmas Concert in Christ Church in Jerusalem’s Old City is always a hot ticket. The annual Christmas Eve concert and singalong at the Jerusalem YMCA includes classical music and Christmas carols. Consider taking a trip north to Nazareth, home to Israel’s largest Christian population. 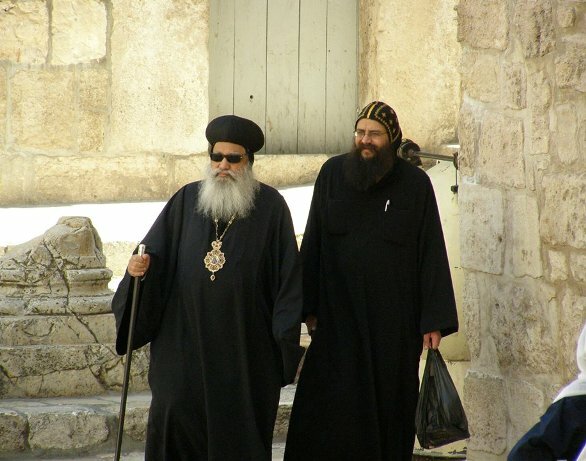 Nazareth was the childhood home of Jesus, where you can visit the Church of the Annunciation and Church of St. Joseph. 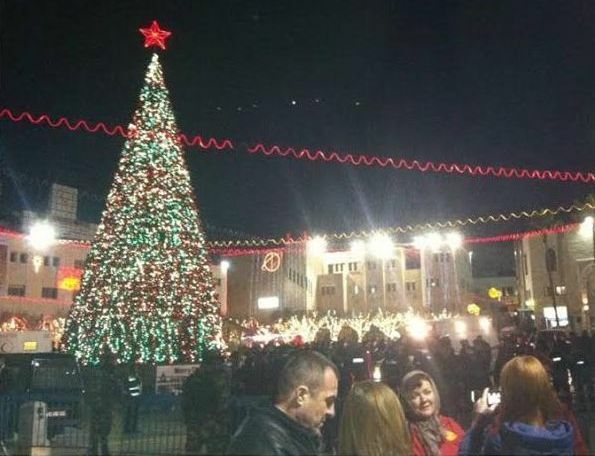 The city of Nazareth starts celebrating Christmas in early December with the lighting of the Christmas tree. Trees decorate the city streets and there are outdoor street fairs and stalls celebrating both Christmas and Hanuka, the Jewish festival of lights. 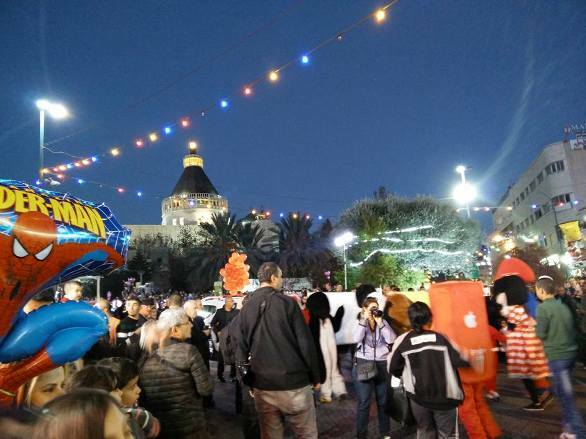 You can join the afternoon Christmas Eve parade culminating in the Church of the Anunciation and fireworks. Christmas Mass is held at the Basilica of the Annunciation at 7 PM. Haifa is one of the few blessed cities in Israel where Arabs and Jews actually live side by side in harmony. Walk around the Wadi Nisnas neighborhood and the German Colony on the weeks before Christmas enjoying the 'Holiday of Holidays' which celebrates Christmas, Hannuka and Eid-Al Adha all mixed together. The streets are decorated with Christmas lights and Santa, arts and craft displays, puppet shows,and you can catch street music performances. Make sure to stop in one of the local Arabic bakeries and try the local sweet of bakhlava delicacies stuffed with nuts, pistachios, and my favorite, a delicious cheese pastry called knafeh. 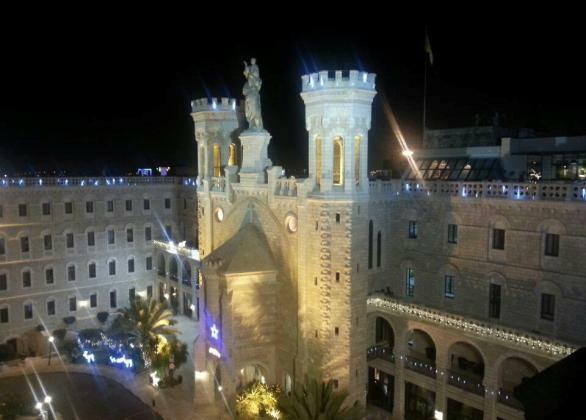 You may also want to visit the Stella Maris Carmelite Monastery in Haifa and participate in carol singing and Midnight Mass or Christmas morning mass. According to tradition, the Monastery cave which you can visit is where the Prophet Elijah hid from the anger of the idolators. Jaffa in Tel Aviv is another place where Jews, Christians and Muslims have lived peacefully side by side for years on end. The winding alleyways of old Jaffa are magical year round and even more so during Christmas, when they are decked out with Christmas trees, lights and Hanukah menorahs. The Jaffa Flea market is adorned with Christmas lights. 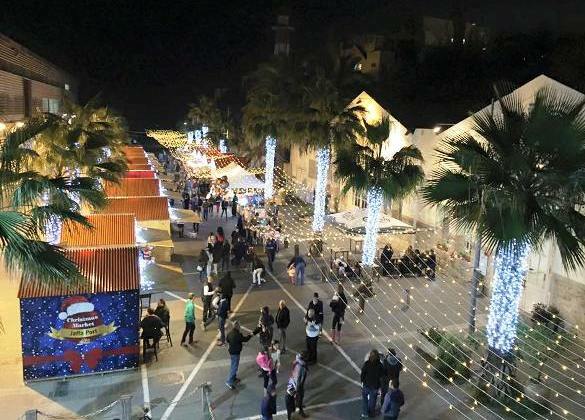 Walk around the Jaffa port which hosts a Christmas market throughout December. There are holiday music performances too. The churches doors are wide open for all – locals and visitors, Christians, Jews and Moslems alike. And most important, don't forget to have a Merry Christmas!